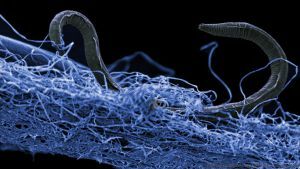 We knew life existed below Earth’s surface. We just didn’t know how much life — until now. The Deep Carbon Observatory (DCO) is a community of more than 1,000 scientists on a ten-year mission to study underground carbon, which can be found in everything from living organisms to fossil fuels. That mission will officially end in October 2019, but on Monday, DCO scientists reported on what they’ve discovered so far: an underground ecosystem twice as large by volume as all the world’s oceans that’s teaming with life — and it could help us discover life beyond our planet. For the project, DCO researchers drilled holes at hundreds of sites across the Earth’s surface and seabed. From the samples they collected at those sites, they were able to determine the size of the deep biosphere to be approximately 2 to 2.3 billion cubic kilometers (470 to 550 million cubic miles). They were also able to estimate the total mass of all the carbon in that underground ecosystem: between 16.5 and 25.3 billion tons — that’s 245 to 385 times the carbon mass of all the humans on Earth. Those aren’t all the DCO team’s findings, though. The newly released report includes a list of other notable research discoveries, including the realization that genetic diversity underground is comparable to or may even exceed that of life above Earth’s surface. It also touches on questions that still remain, such as whether this underground life began on the surface and moved downward — or vice versa. Interestingly, the report’s comments section contains one of its most intriguing insights. In other words, the massive world we’re discovering beneath the surface of our home planet could one day help us inhabit others — or maybe even lead us to alien life.